Halloween is coming! This Friday, it’s the spookiest night of the year and if you fancy getting creative in the kitchen (maybe you’re throwing a party? ), have a read of our delicious (and slightly gruesome) Halloween recipe ideas. Jelly – There’s definitely something a little spooky about jelly, the way it wobbles and looks like it has a life of its own. This makes it perfect for Halloween party food. 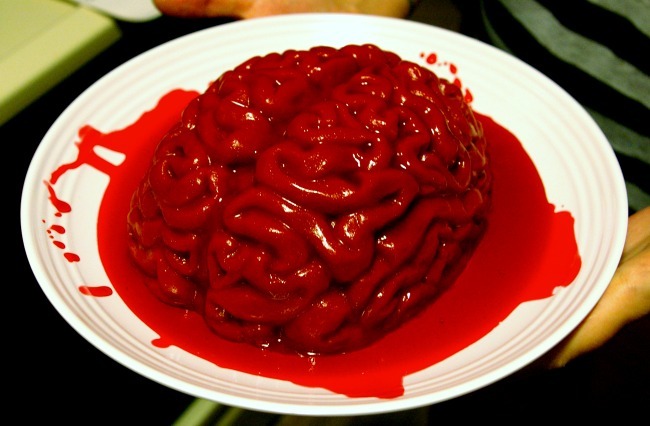 The eerie brain above is made with a creepy jelly mould and strawberry sauce, but another great idea is to make mini jellies with wiggly worms or other creepy jelly sweets set inside them. 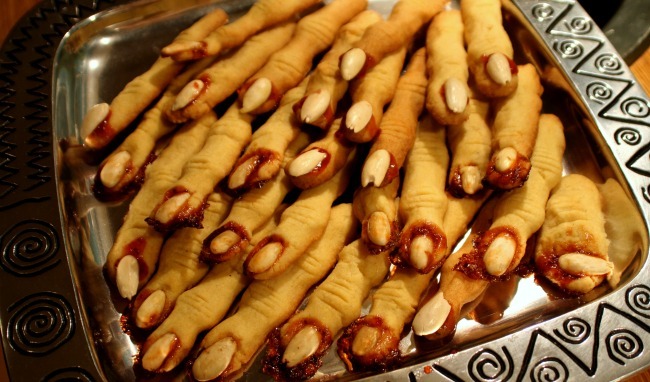 Witches’ Fingers Biscuits – These are easy to make, yet have maximum spooky effect making them perfect for parties! Use a standard cut-out biscuit recipe but instead of cutting them out, shape them into oblongs. Pinch them twice longways, to make the knuckle shape and use a knife to cut knuckle creases. For the nails, dab a bit of jam on the end and stick an almond or half a peanut on to each finger. Add more jam to the end of the finger for extra gruesomeness! Cook as normal and voila! A disgustingly delicious party snack. 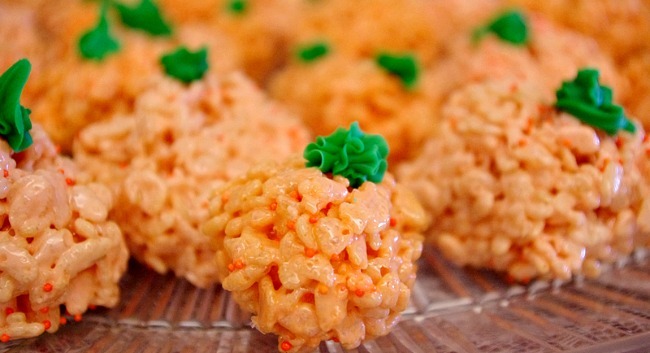 Pumpkin Krispie Cakes – These yummy party treats are super simple to make. Melt marshmallows, tint with orange food colouring, mix with Rice Krispies, shape into slightly flattened spheres and decorate with green icing. They look and taste great! 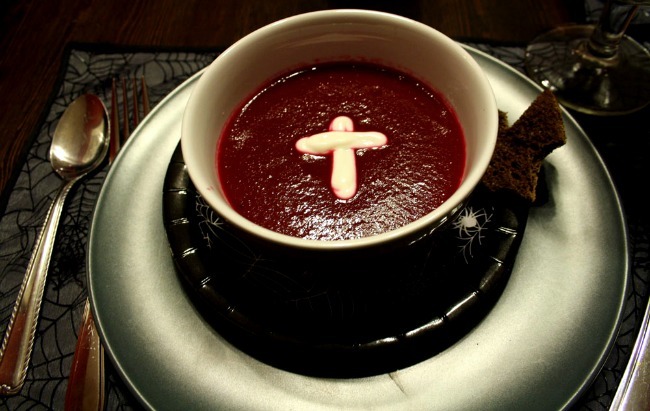 Vampire Beetroot Soup – Beetroot is extremely good for you and Halloween is the perfect time to serve some up for a vampire-themed meal. Apart from beetroot, choose whatever vegetables you like to put in your soup – we recommend roasting some tomatoes and garlic in the oven for half an hour until soft, before passing through a sieve to make smooth. Then, sweat an onion in the pan, add some stock and the beetroot and bring to the boil. Let it simmer for about 10 minutes until the beetroot is soft, before adding the tomato and garlic and (this is the essential part) mixing in a blender to make it completely smooth and blood-like. Add a creme fraiche crucifix for added effect. Ghostly Snacks – Quick and easy to make, are these ghostly pizza and fruity Halloween snacks. For the pizza, slice a bread roll in half, cover with tomato puree and thinly sliced mozzarella cheese, vegan cheese or another white cheese. Then decorate a spooky face using olives, tomatoes or whatever else you fancy, before popping under the grill. For freaky, fruity snacks, simply peel some mandarins and put small sticks of celery in the top to make mini pumpkins. Finally, banana ghosts are created by slicing a banana in half and decorating the front with small chocolate chips for eyes and a slightly larger chocolate chip for the mouth – tasty and healthy! If you love getting creative in the kitchen, why not try one of our fun and tasty cookery courses? Images from Martin Jarosinski, Jill, ohocheese, Stacy K, Kelly Garbato and Cozinhando Fantasias.